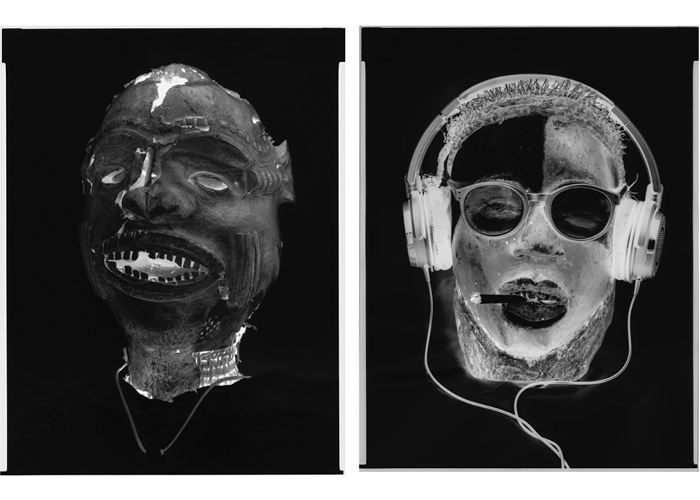 Fearsome, playful and profound simultaneously, these photographs of African masks from West Africa (Nigeria, Gabon and the Ivory Coast) by artist and scientist Hennric Jokeit, are bound to evoke a number of responses and questions on the part of the viewer. Firstly, what are the original sources of these curious forms – and having thus discerned their (functional) origins – does this smack of misappropriation, a form of cultural imperialism? Secondly, and as a corollary to the first point, can such masks simply be isolated as aesthetic (a late Western invention) artistic objects impervious to function and societal meaning? Thirdly, if we grant that such photographed objects can indeed to be viewed as art, why the favoured style of the artist, namely the inversion of white (light) and black (dark) – in a word: negative photographs? Herbert M. Cole (1985) writes about masking as one of Africa’s most significant cultural phenomenon. Although it is difficult to trace back to mankind’s primitive forebears, masking and masquerades are “probably Africa’s most resilient art form” (1985, 16) and includes functions such as: passing into manhood; spirit-associated transformations; ways of dealing with hunting and as integral to a kind of theatre where say dance and consume are significant. Clearly such masks were not meant to be “fixed” and immobile in a museum or the like. At the same time, this does not diminish their aesthetic appeal and Cole goes on to say that such masks “can be seen as works of art both within and outside their parent culture” (1985, 17). Now this opens up the possibility for social exchange, for what I call postmodern intersubjective, cross-cultural play. In such respects, Jokeit’s “incursions” are not so much misappropriations or worse, cultural plundering, but continues a search in the West for the “other side”. For when Dadaism and later Surrealism sought the negation of Western art and its institutions and questioned it in the process – when Gauguin, Picasso and others sought inspiration from the so-called “primitive” – and when Europe and later America engaged with Africa, it too changed and perhaps so-called “classical” ideals. This reassessment of ideological truth within an economic system often blind to such meanings – and now the reclaiming of silenced voices and the perennially repressed within the artistic mainstream – perhaps renders Jokeit’s use of such masks as both timely and significant. At the same time, distinctions need to be made. These African artists were not simply doing portraiture with their masks as in the Western tradition, but simplification, distortion and exaggeration is used in order to capture, as it were, a spirit, to embody spirit through the mask. The wearer is proclaiming he is not simply himself, but in a sense possessed by a character, a spirit. This insight is important and prevails despite industrialisation, bureaucratic government, Christianity, Islam, school education and modern medicine, such that masking and masquerades form part of African culture (adapted from Cole 1985, 19). Now this begs the question: do Jokeit’s masks bear that incarnation of spirit? What is meant by spirit in this context? When viewing the series of a photograph one is struck by the potent energy. Bursts of light, halo-like, are evident and fissures in the skulls reveal further light. An x-ray like play of light – at once defining hollow and flat forms – as well as heavy and dramatic. There is a sense that indeed that too portends to creatures of some order, as if they house complex ideas around the human capacity to see, to hear and even to move. Eyes are vacuous shapes that pierce the viewer as if their energy (spirit) lies on the precipice of life and death. In these respects they both incorporate the primeval place such masks may have had in their host culture , and yet go beyond that in their been used in a new and blindingly adventurous capacity. Jokeit has achieved this via the eight to ten-inch large format camera to expose photo paper directly, a process resembling that of Daguerre around 1850 at the very beginning of photo-history. In simple terms, the dark has become light and the light, dark, which Jokeit dubs “native negatives”. In this sense, the series of works so named “migrations” explores both the mirror of African masks in a Western context, and the West as a mirror of its African forebears (no telos here implied) where migrations caused skin colouring to change over time, a kind of biological anthropology if you will. The important point is that such dark/light contrasts obfuscate what is actually white and what is actually black. I like to call that ambiguity “the other side of the other side”. In this sense, black and white are actually blurred and often a murky grey distempers the rigid black/white dichotomy. Cole lends further weight to the symbolic import of black and white as he makes the point that bright-coloured, delicate features are female, while the more numerous darker masks are male, and while greys are “in reality are more characteristic of people and events than the polar extremes of black and white” (1985, 25). Essentially, this dialectic argues for the co-operation between extremes – in Eastern thought one might speak of the harmonic amalgamation of ying and yang. While one can thus impute the universality of culture within this dialectical system that mediates opposites, one can thus argue for the universality of spirituality, though variously expressed in particular cultures and in accord with the evolution of various styles the world over – and as particularised in the masks and masquerades of Africa. Jokeit simply adds to the tradition of reflecting on our human currency for spiritual connectivity and ancestral origins or rather supernatural intuitions, while nurturing the cultural interinclution of cultures (consider the apparels to the masks the artist uses). The old developed “Christian” versus the “primitive, wild un-Christian” is outdated and incorrect. Rather, one needs to consider the “other “ of the “other”, and the “other” within self, that is a necessary scientific and artistic investigation that these images convey. In the process, binaries are circumvented without unjustly simply decontextualising or ignoring the fact that all cultures are prejuduced and ideologically and conventionally loaded. Thus by incorporating, changing and transforming these masks within a new context – and aesthetically changing their visual power in new ways – it challenges, invites debate and urges one to both recognise the overarching interconnection of cultures, while not losing sight of the specificity and particularity of any one culture. It proffers to both local ingenuity, to individual creativity and cross-cultural overlaps and the blurring of boundaries; hybrids of sort. Cole, for example further says that: “the masking arts are to life what poetry is to prose: compressed, intensified, symbolic and metaphorical. World views and basic human values are acted out in striking visual forms at once entertaining, spiritually powerful, and crucial to the continuity and equilibrium of life” (1985, 25). This, indeed might be what some maintain for art itself and in these respects the surface that is visual art, for example, is itself a mask – its wearer is the spirit evoked by the artwork. Jokeit’s interventions it would appear, in their “negation” artfully inverts in their luminosity, in their slick alterations, the luminal space between life and death, recalling the intensity of masks from West Africa, their influence on the West and the ongoing dynamic shared wherein experimentation is the order of the day, where learning, creative expression and prosperity can be ubiquitous. Hennric Jokeit is a professor of neropsychology in Switzerland. I would conjecture that his scientific training and the processes of visual perception, memory and learning have had a marked effect on his artistic output.